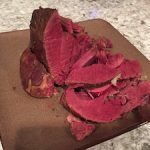 Venison roasts. Venison steaks. Ground venison. I just want a sandwich already! Now, while I’ve made some damn delicious venison steak sandwiches, I like options. 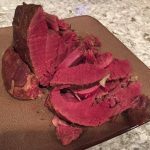 If you are ready to try a new recipe, make some smoked venison pastrami! 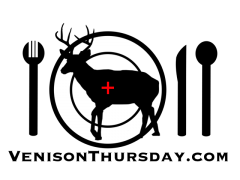 I think a lot of hunters are intimidated when they get into to realm of cured meats, but in the end, the process isn’t complicated. It just takes some time. And a little practice. 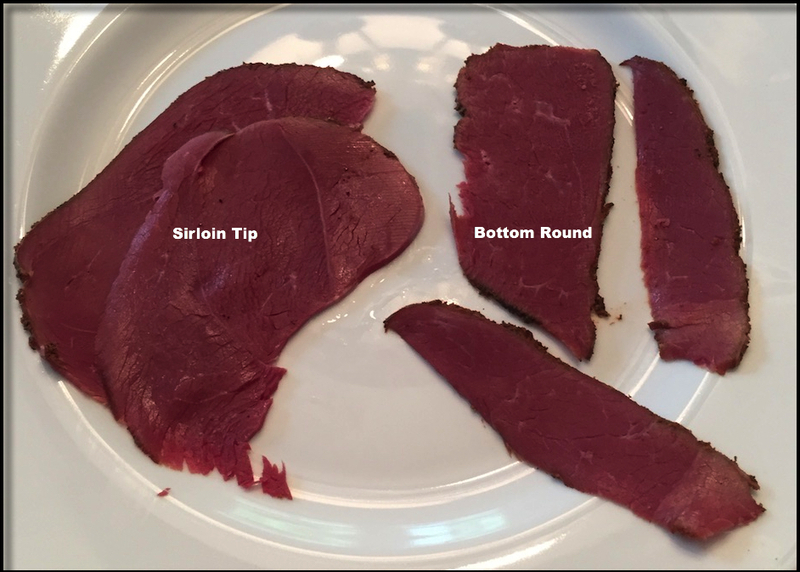 Start with smaller roasts till you learn to get the flavor you like – 2 lbs of lunch meat that came out too salty goes WAY faster than 6 lbs..
Pastrami starts with a brining process, commonly called corning, which I’ve covered here. 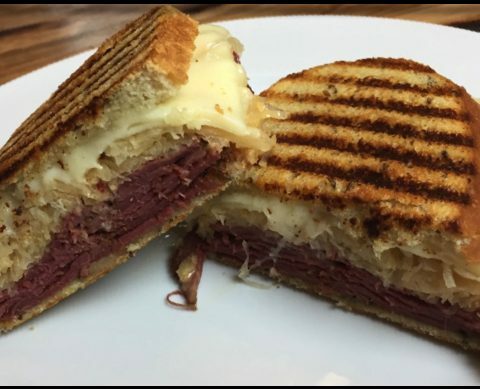 Once you’ve corned the roast, you have the option to braise/boil it, or smoke it into a pastrami. If you smoke the brined result directly, it’ll be way too salty. Soak it in ginger-ale overnight (refrigerated). You can slice and fry a piece for a taste test to determine if additional soaking is needed, but overnight should be fine. Mix everything thoroughly together in a bowl. Rub it thoroughly over the roast, getting a nice coating. Throw the roast in a smoker set (and pre-heated) to 220° and smoke it with a nice hardwood. About a cup of hickory chips is what I usually use. I never soak the chips. Put the wood chips in AFTER the smoker is pre-heated, otherwise they will all just burn up before it gets to temperature. The smoke isn’t meant to last the whole cooking time, probably just about an hour or two at the most. You can experiment with that of course. 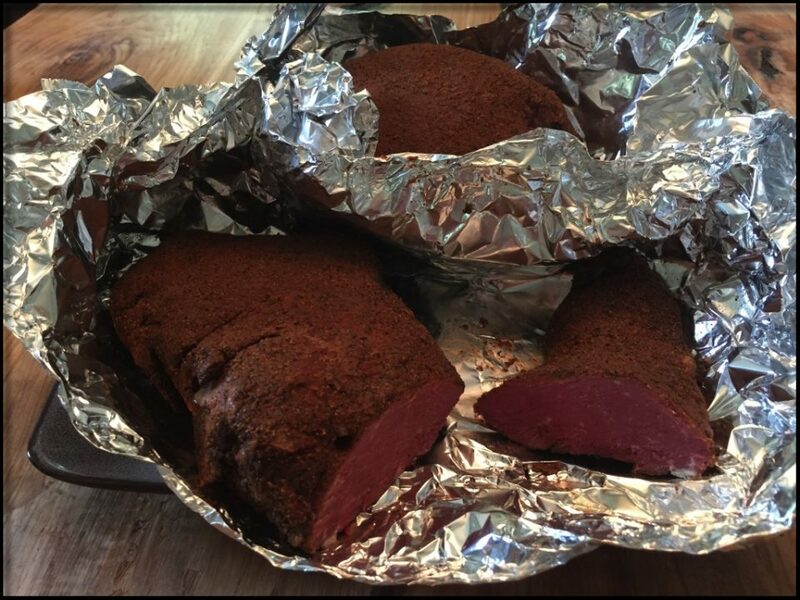 Venison pastrami smoked, and cooled, ready for slicing. If your smoker doesn’t have a food temperature probe built in, I strongly recommend getting one for it. It saves you from having to open the smoker to check the temperature – which drastically drops the temperature, especially if you smoke on a cold or windy day. When it’s up to temp, let it cool, then slice up for sandwiches. I usually wrap it in foil, and toss it in the fridge till the next day when I slice it. The choice of roast you pick will influence the size of the slices you can cut. While it is quite tasty cold, it is AMAZING heated up a little. Throw it in a pan with some swiss cheese on top, just till the cheese get’s melty. OR, use a panini press. It heats the meat/filling up while grilling the bread at the same time. 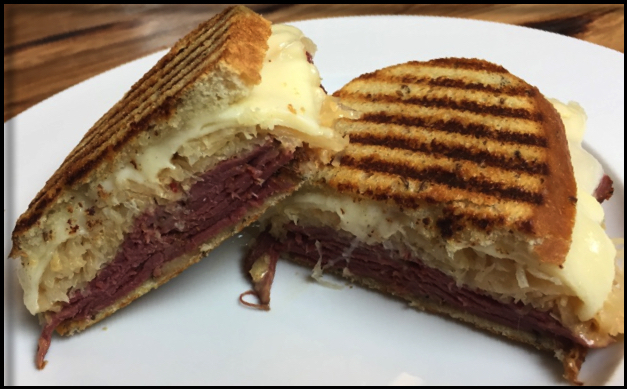 Pastrami starts with a brining process, commonly called corning. 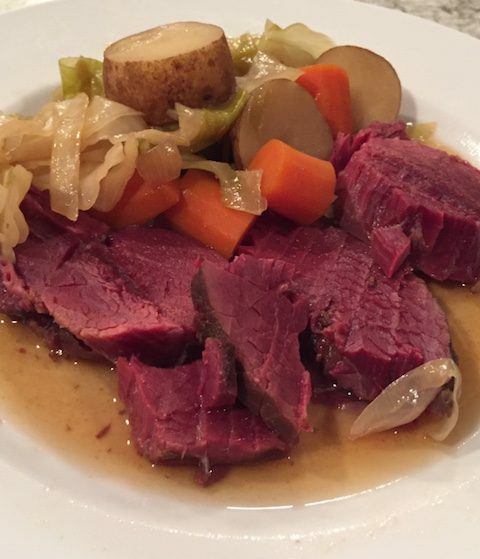 Once you've corned the roast, you have the option to braise/boil it, or smoke it into a pastrami. Rub it thoroughly over the corned roast, getting a nice coating. The smoke isn't meant to last the whole cooking time, probably just about an hour or two at the most. You can experiment with that of course. If your smoker doesn't have a food temperature probe built in, I strongly recommend getting one for it. It saves you from having to open the smoker to check the temperature - which drastically drops the temperature, especially if you smoke on a cold or windy day. When it's up to temp, let it cool, then slice up for sandwiches. I usually wrap it in foil, and toss it in the fridge till the next day when I slice it.